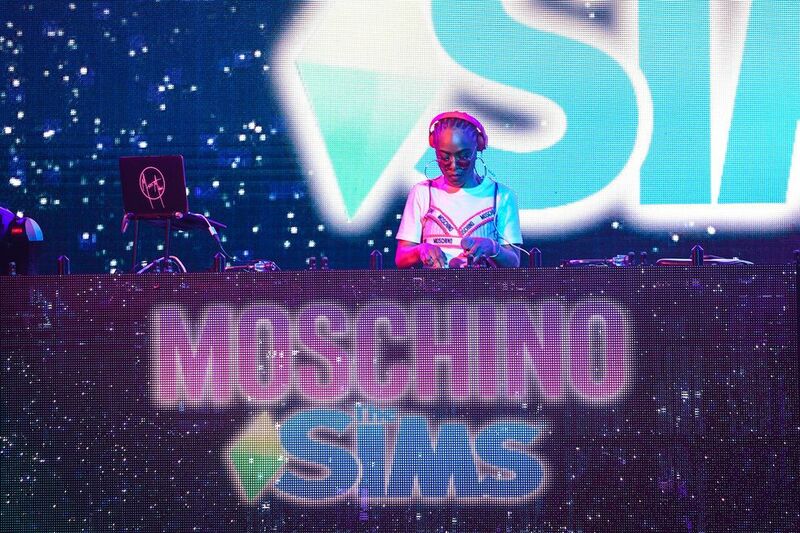 Like a VR mirage in the middle of the Indio, California desert, Moschino created a The Sims-themed paradise on Coachella weekend in honor of their latest capsule collection in collaboration with the popular virtual reality game. The party had everything from a giant slide and rollerskating rink, to SONIC burgers and ice cream sandwiches. The 3D green diamond icon was, of course, everywhere. And the guest list was, as expected, straight out of The Sims "Get Famous" expansion pack — filled with our famed faves. Among those in attendance were designer and Moschino's creative director Jeremy Scott, beauty industry bosses Nikita Dragun and Bretman Rock, drag superstars Aquaria and Raja, the iconic Gigi Gorgeous, Cardi B's influencer/ model sis Hennessy Carolina, artists like Pabllo Vittar and Saweetie. The Chilling Adventures of Sabrina actor Kiernan Shipka, On My Block's Diego Tinoco, and many many more. The night featured a performance by Aquaria, who played her original song "Burn Rubber." There were amazing DJs, including sets by Diplo, Mazurbate, and A-Trak. Vittar even made an appearance in the middle of one, while Saweetie also made sure to drop some sick bars on the stage. See all the FOMO-inducing photos in the gallery, below.